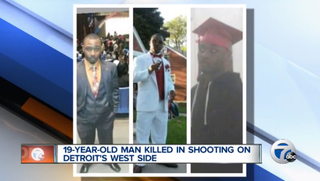 A Detroit teen lost his life after being gunned down by suspects in a vehicle while he was on his way to work, WXYZ reports. Patrick Jones, 19, had just gotten $3 from his sister Chania Ventura to take the bus to work when he was attacked. Ventura said the $3 was all he had on him. "You took somebody's baby, an innocent life, for no reason. He didn't have nothing but three dollars on him. … You killed him for no reason," she said. "He just didn't deserve this." Early Thursday morning at about 4:30, Jones was walking down the street when four suspects in a silver or gray 2007 Chevy Impala pulled up beside him. According to WXYZ, two of the suspects reportedly got out of the car with guns and started shooting the teen, who attempted to run. "I loved him," his mom, Charease Chisom, told the news station. "He was a good person, on his way to being a man. … He just didn't get a chance, right along with the rest of these children, dying for nothing." Police believe that an attempted robbery was behind the attack.